This entry was posted in Computing and tagged Anniversaries, Commodore 64, Computing, nostalgia, Video Clip by Les. Bookmark the permalink. Ah yes I remember those years! Especially “Les for crying out loud come and eat your dinner!!! !” But I must admit having Momma’s Corner on the BBS was a lot of fun! I still have mine, on the shelf. Les… way to go to make me feel old. I started off with the Atari 400. 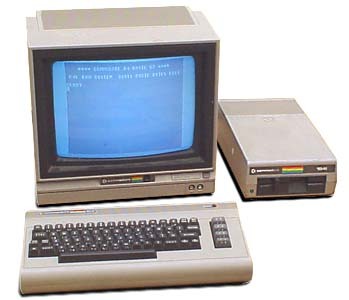 Couldn’t stand the keyboard and eventually got the 800 with a tape drive. My final 8-bit computer was a 1200XL with 2 floppies. 300 bps and having my modem on redial to get on the popular BBS’s was fun. I have my Atari 1200XL in a box. Then moved on the Atari-ST series instead of the Amiga. I will admit I should have went with the Amiga. Topped out at 19.2 kbps dial-up Internet. I sill have my Mega-ST in a box with a whopping 52 MB hard disc!!! After several used Macs (not paying full price of Apple stuff… I’m not rich)… I am now writing this on Mac OS X running on PC hardware I built myself. I run Windows 7 on the other hard disc. However, Apple is pushing me towards PC because its latest stuff is REALLY dumbed down. I liked Mac OS X because of the option to fooling around with its flavor of BSD Unix, but now they are turning Mac OS into a giant iPad. I’m not sure if Windows 8 will be any better though, so I heard they are also trying to unify desktop Windows with handhelds. It’s hard to believe it’s only just a bit over 3 decades. Look how long vinyl records stayed on the market compared with CDs. Things move so fast nowadays. Yet the Apple II was better is every way. Awwww, poor Moloch felt left out. I was in Costco the other day and saw 3 TERAbytes for $120. Does any one else remember the hype when the estimated world storage capacity passed 1TB? We all know you’re a closet Apple lover Les. I started with Atari 8-bit, (Used) better chipset, insufficient memory, and the same people who designed the Atari 400/800 worked on the Amiga for an encore. When Jack Tramiel was shown the unwelcome mat at Commodore, he bought the husk of Atari from Time-Warner and poached some engineers, so the 520/1040ST was C-64ish. Back in the late 80s, a clever programmer wrote a bouncing ball demo that looked like Amiga’s, but ran on a 48K 800, of course, the 800 was doing nothing else while the demo ran. Home computer history seems very much clever folks, building on the work of others, “Ooh, look what the Steve’s did, I bet that if I did this a little different, it would be better.”, over and over again. Now writing this on a two year old Mac mini, with a million time more memory than that first, second hand Atari. I still have a Vic 20 with homemade wire wrapped 5K ram expansion. A C64 computer 1541 floppy drive and an Amiga 500 that I eventually got a 5 megabyte scsi hard drive for it and I was in heaven! The first MS DOS machine I owned was a Commodore Colt 8086 based with I think a 16MB mfm 5 1/4 full height hard disk, monochrome /amber display. I still have that too! We were a C64 family as well. I used it for my university essays, which was a hell of a lot easier than trying to write stuff on a manual typewriter. We had a copy of Impossible Mission, but I’m not sure whether we actually bought it or not. I think my brother got it from a friend, and given what copy protection would have been like in those days it may have been a copy. Amazing that you could get “realistic” voices out of it. We also had some game on a cartridge whose name escapes me. The actual cartridge came apart pretty soon after we got it, but you could still stick the enclosed circuit board into the C64’s card slot and play the game. The machine’s SID sound chip was popular enough that it was used for a stand alone instrument, Elektron’s SIDstation. You said above “I owe my career as a tech support wizard to my Dad and his decision to purchase a Commodore 64”. How come?! Please write and post a short program in Commodore 64 BASIC which draws a single line on the hires or lores graphics screen. No machine code allowed, only Commodore BASIC V2. On Atari 400/800/XL/XE computers this can be done quite easily using the commands GRAPHICS [number], POSITION [X,Y] or PLOT [X,Y], COLOR [number], and DRAWTO [X,Y]. Other computers have similar commands, but NOT the Commodore 64!